Eight remanded for kidnapping nuns in Ondo. AN Akure Magistrate’s Court, in the Ondo State capital yesterday remanded eight persons, including a woman, for allegedly kidnapping two Catholic reverend sisters on the Benin-Ijebu Ode Expressway at Kajola village, Odigbo Local Government Area of Ondo State. The victims, Apo Perpetual and Roseline Familade, with their driver, Zwugwa Zibai, were abducted on May 15, when they were traveling to Ogun State for a programme. The arraigned suspects include a couple, Reuben Akinbehinje and his wife, Abimbola. They were charged on a seven-count bothering on kidnapping, robbery and conspiracy, contrary to relevant laws of the state. 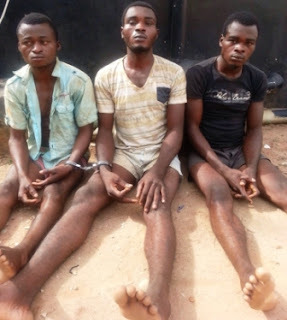 The prosecution, led by John Olowokere, said the accused persons allegedly conspired to kidnap and rob the reverend sisters and their driver two months ago before they were apprehended by the police. He noted that they were kept in the custody of Department of State Service (DSS) and could not be arraigned immediately they were apprehended just because the judiciary went on strike. Olowokere sought the court’s order to remand them in prison pending legal advice from the directorate of public prosecution. Counsel to the accused, Yemu Egbodofo, who noted that the court lacks the jurisdiction to try the case, however, said he would not belabour the application by the prosecution so as to fast-track the matter. The trial Chief Magistrate Adedapo granted the application that the accused be remanded at Olokuta medium security prison. He adjourned the matter till August 16 for review of the case.